The leaves have turned, the temperature has dropped, and Halloween is only a few days away. Although it has been a great month and an even better start to the Autumn season, I'm sad to see October, my favorite month, pass by so soon. One of my favorite October traditions happens to include a Giant Eagle bakery classic - incredibly soft, frosted pumpkin drop cookies. 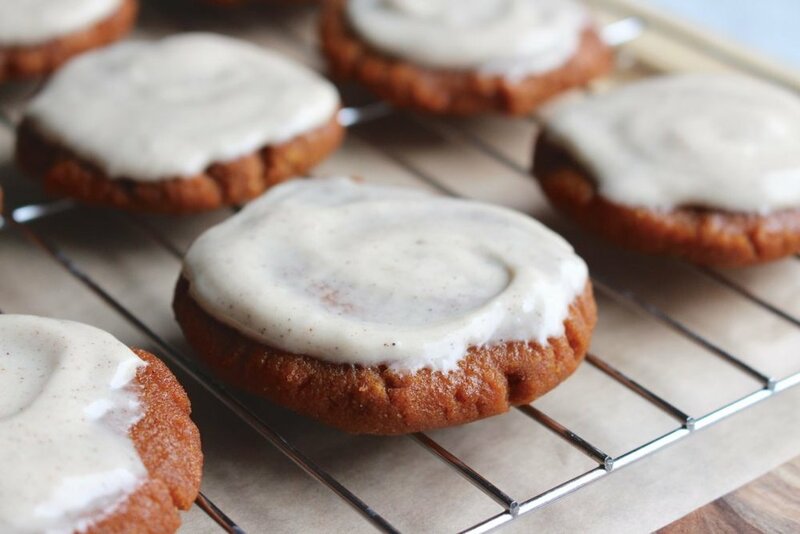 With sweet and vibrant orange icing, an irresistible pumpkin flavor, and a dough so soft it practically melts in your mouth, these seasonal cookies are everything! And I'm not the only one - anyone who shops at Giant Eagle knows about "the" pumpkin cookies - they really are that good! Of course I will be/have been enjoying plenty of my favorite pumpkin cookies, but I also wanted to test a recipe of my own using simple and nutritious ingredients. I knew the hardest part would be remaking the sweet frosting and the soft texture of the cookie. These are two very well known aspects of "the" pumpkin spice cookie, and my recipe must compare in order to resemble the classic treat. With a healthful version in mind, I started with my base of pure pumpkin puree, whole eggs, and honey. Each ingredient contributes to the overall flavor and texture of the cookie. I wanted to choose all things soft and creamy to resemble the original texture. As for the dry ingredients, I wanted to choose wholesome ingredients that would keep the texture soft and pliable, while adding minimal flavor. Coconut flour is a great grain-free and gluten free flour that can be used in small amounts due to it's ability to absorb liquids. It also has a subtle "nutty" flavor that actually complimented the pumpkin spice very well! With a little swap here and there, I am happy to say, these pumpkin cookies are everything I could have hoped, wished, and wanted them to be! Soft, moist, and sweet all in one. I used all natural and nutritious ingredients at every step, focused on building flavors through real food, and can honestly say they proudly compete with the real deal! I hope you all love this recipe as much as we do, especially to those in the Youngstown area that live for Giant Eagle cookies as much as we do! Preheat the oven to 375 degrees and line a baking sheet with parchment paper. In a large mixing bowl, whisk together the pumpkin puree, eggs, and honey. Once combined, gradually mix in coconut flour, pumpkin spice, and dash of salt. Set aside. In a separate bowl, mix the softened cream cheese, honey, and pumpkin spice until smooth and lump-free. 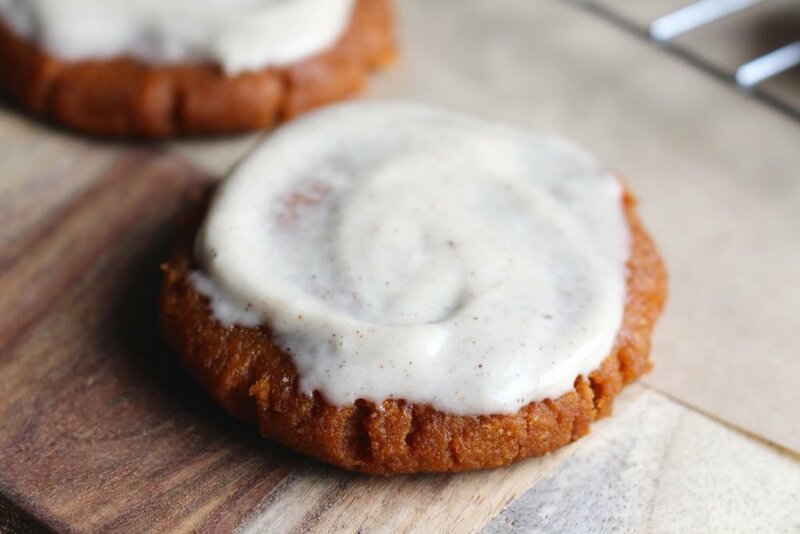 If you prefer a spicier frosting, feel free to add more pumpkin spice seasoning or preferred seasoning in itself such as cinnamon, nutmeg, or cloves. Once the icing is ready, let it chill in the refrigerator until the cookies are ready to be frosted. Using a tablespoon, spoon out the cookie dough and carefully form cookie dough balls on the baking sheet. The dough will be soft to touch and less compact than traditional cookie dough - that's okay! Once you have 6-10 individual balls on the baking sheet, gently press the dough flat. I like to use the bottom of a glass for an even cookie surface. Bake for 15-20 minutes at 375 degrees. The cookies will become firm to touch and slightly darker in color. For a softer and more moist cookie, feel free to take them out of the oven around the 15-minute mark. For a more dense and crisp cookie, check at 20-minutes and return to the oven for an additional 5 to 10 minutes if need be. Once the cookies are finished, remove from the oven and cool before frosting. The frosting is cream cheese based, it will become soft if the cookies are still warm. Evenly spread the cream cheese frosting over the cookies and enjoy! I prefer to store these in the refrigerator to keep the frosting cool and the cookie moist! I hope you love this recipe as much as we do!